Henrik Sedin led the NHL in scoring and captured the Hart Memorial Trophy as the league's most valuable player for the 2009-2010 season. 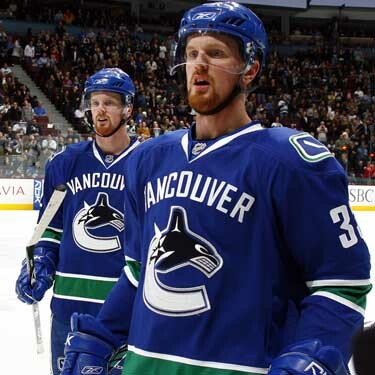 Before his breakout year he was mostly known for being identical twins and lifetime linemates with his brother Daniel Sedin. Taken one spot after Daniel in the 1999 National Hockey League Draft by the Vancouver Canucks, he was supposed to be the playmaker while his brother was to be the scorer. He came face to face with another rising star in 2008 when he crossed paths with me. I had just left my job at ResponseTek and was about to embark on my oriental oddysey. I met him in GM Place, the home of the Canucks. Preparations were under way for Vancouver fan favourite Trevor Linden's retirement ceremony. His #16 jersey was to be raised to the rafters the follwong night, so no one was allowed onto the skating surface of the arena as rehearsals were taking place. We chatted briefly outside the team dressing room and posed for some photographs, before I was herded off to the press room and he went off to do some exercises.